Perspectives on greener product development and manufacturing from Sustainable Minds, our partners, customers and contributors. Take a look! 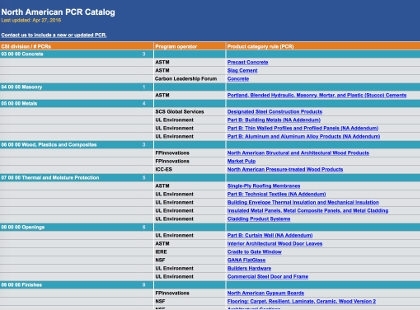 Is there an expiring PCR in your industry or one you’d like to create? The increasing need for a centralized, curated source of PCRs created for North America. Until now, there has not been an organization to take on the responsibility of creating and maintaining this asset. A consortium of North American program operators seemed like the most likely candidate for the task. To inventory and benchmark the state of PCR development in North America. At the time of publication this process revealed 53 North American PCRs from 8 different program operators/programs. 13 had already expired or will expire in 2016, 11 of which are addenda to European PCRs. Plus, of the 35 MasterFormat® Divisions, only 15 had PCRs. Each program has different rules, and PCRs created by the same program operator may not even be comparable, thus further highlighting the need for, and clear benefits of, one common set of LCA rules and reporting requirements.